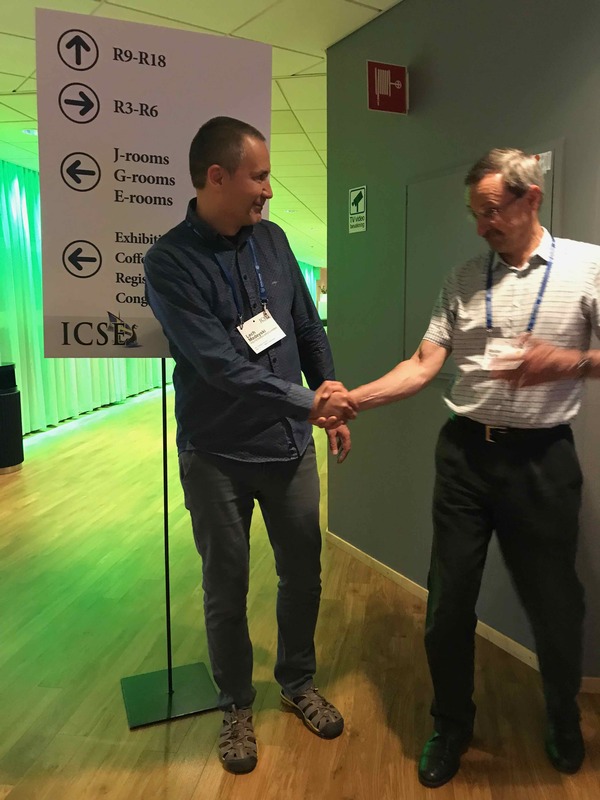 Together with Prof. Mika Mäntylä, I’ve a pleasure to chair the Emerging Results and Vision Papers Track of 23th International Conference on Evaluation and Assessment in Software Engineering EASE’2019 (University of Copenhagen, Copenhagen, Denmark, April 15-17, 2019) ranked as “A” in the EAR/CORE Rankings of Worldwide Journals and Conferences. 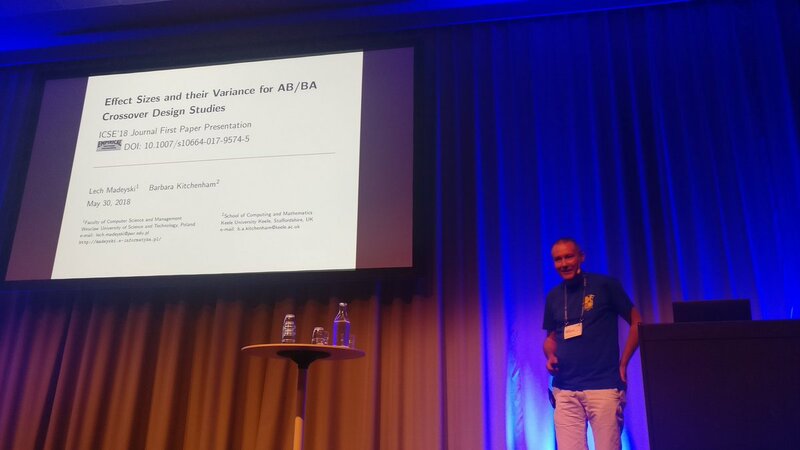 I had a great pleasure to be invited to present results my joint research with Prof. Barbara Kitchenham on “Effect Sizes and their Variance for AB/BA Crossover Design Studies” at the highest ranked (CORE-2017 A*) International Conference on Software Engineering - see photo by Prof. Andrzej Wąsowski on Twitter. Btw. I’ve to admit that I did not know that Prof. Władysław Marek Turski gave a keynote on “Software Engineering As it Will Be” (entitled “Look Ahead at Software Engineering”) at the 4′th ICSE in 1979. 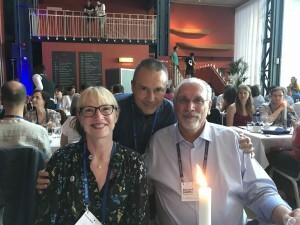 Other keynote speakers were Brian Randell (“Software Engineering As it Was”), Barry Boehm (“Software Engineering As it Is”), and Edsger Dijkstra (“Software Engineering As it Should Be”). Grab the opportunity and submit your paper to special issue on Software Engineering Methods, Tools and Products Improvement and Evaluation in Foundations of Computing and Decision Sciences (open access, no fee journal indexed by Web of Science-ESCI and Scopus). 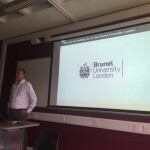 In September 2017, I had a great pleasure to visit Brunel University London at the invitation of Prof. Tracy Hall (Head of the Department of Computer Sciences, College of Engineering, Design and Physical Science, Brunel University London, UK) and Prof. Martin Shepperd (Chair of Software Technology & Modelling), and gave the invited lecture entitled “Towards More Credible Empirical Software Engineering Research”. 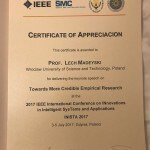 I gave a keynote “Towards More Credible Empirical Research”at IEEE International Conference on INnovations in Intelligent SysTems and Applications (INISTA’2017). I will give the keynote speech “Towards More Credible Research” at the IEEE International Conference on INnovations in Intelligent SysTems and Applications (INISTA 2017) in July 2017. 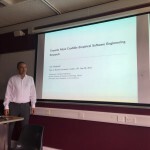 The aim of the talk is to discuss some problems with credibility of empirical research in software engineering (and beyond) and how to mitigate them. 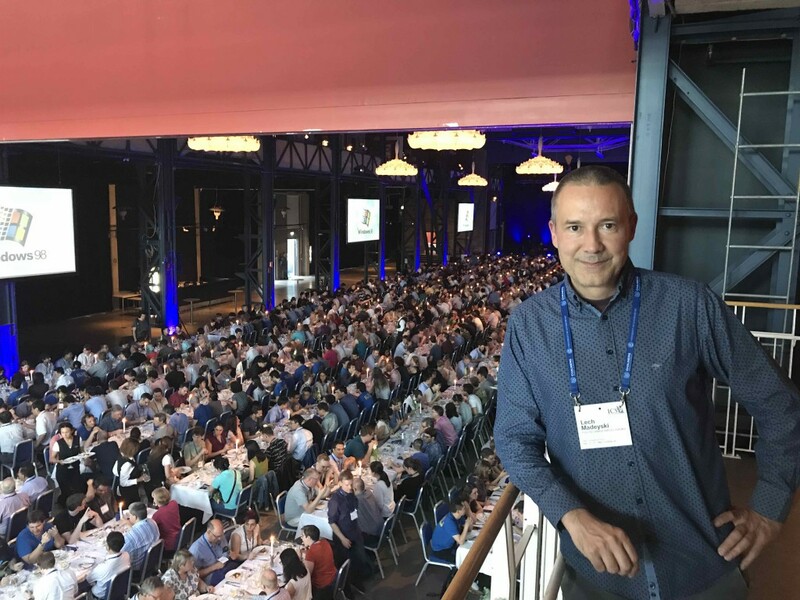 The focus of the talk is closely related to the special issue on “Enhancing Credibility of Empirical Software Engineering” in the Information and Software Technology journal (Elsevier), where I serve as a guest co-editor. INISTA 2017 is organized by Gdynia Maritime University, Poland, in cooperation with Yildiz Technical University, Turkey, IEEE Poland Section, Polish Chapter IEEE Systems, Man, and Cybernetics Society and IEEE SMC TC on Computational Collective Intelligence. 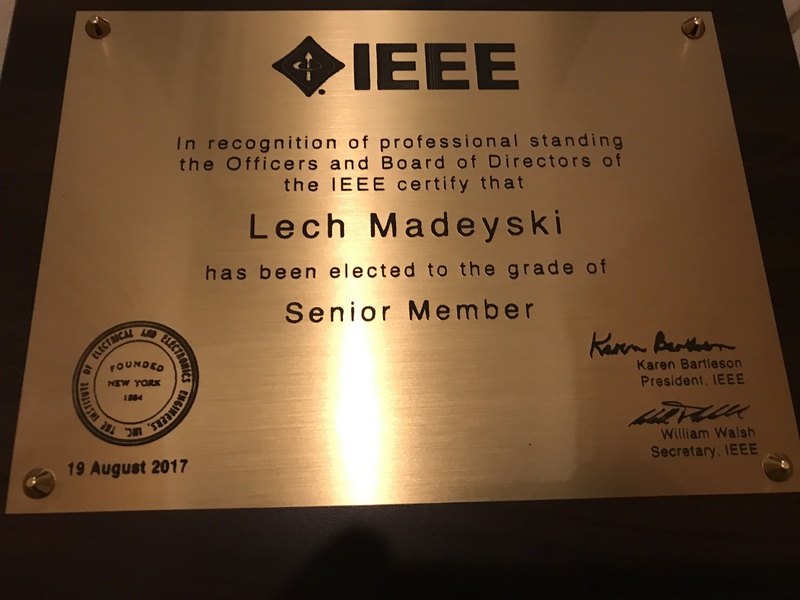 Prepare an (in)credible paper on “Enhancing Credibility of Empirical Software Engineering“! 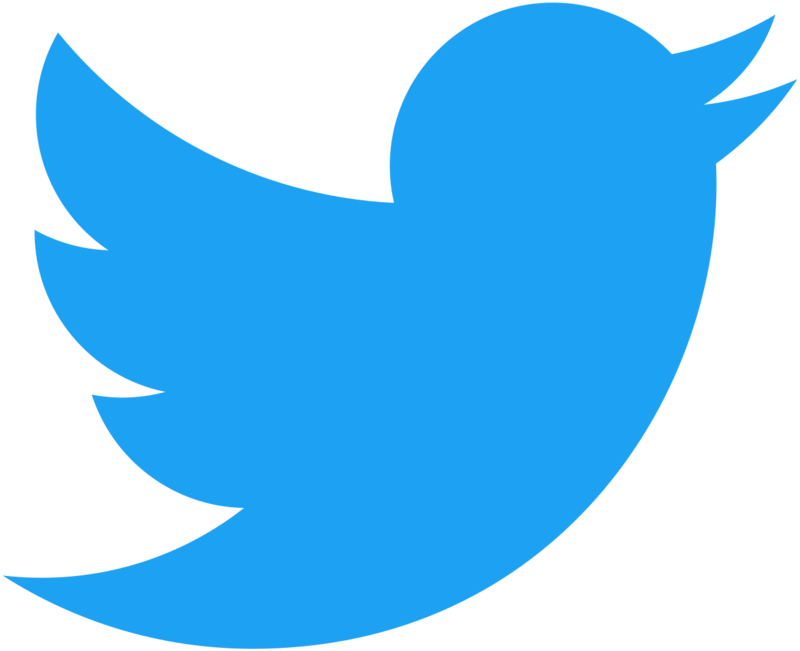 Special Issue of the Information and Software Technology (Elsevier) – see Call for Papers! 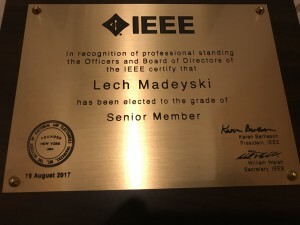 On October 12, 2016, I had a great pleasure to gave the invited lecture entitled “Empirical Software Engineering Research from the Trenches” at the invitation of Professor Roman Słowiński (Head of the Committee on Informatics of the Polish Academy of Sciences). 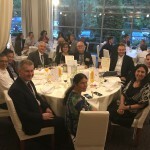 The lecture was given during the meeting of the Committee on Informatics of the Polish Academy of Sciences in Warsaw. Today I had a great pleasure to receive Elsevier’s Information and Software Technology (IST) Journal Reviewer Award ”for Exceptional Contribution to the Quality of the Journal when Serving as Reviewer from 2014 to 2015” given by Prof. Guenther Ruhe (Editor in Chief) and Dr Gaia Lupo (Publisher).